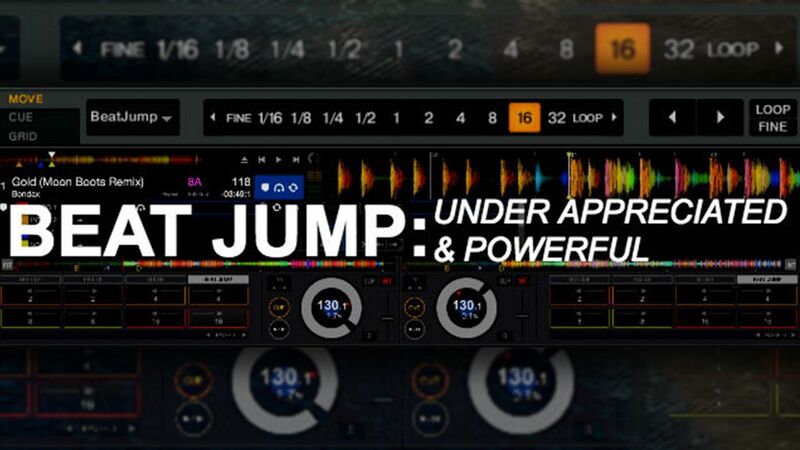 Compared to cue points, looping, and effects, beat jump is one of the more rarely discussed DJ software features. It’s underutilized by a majority of DJs, mainly because many DJs don’t know how to use it effectively. Beat jump is a powerful tool not only during performance, but it can speed up preparation time as well. Imagine throwing on a new track in the middle of your set, but you aren’t sure where to mix it in seamlessly. You have to scrub back and forth through the track to find the right spot, then worry about how far back you need to bring the track to give you enough time to mix in. In the heat of a set, having to go through those steps can take you out of the moment and ruin your groove. Beat jump can simplify this process and make it feel effortless. Beat jump allows you to skip forward or backward through a track on beat, based on the beat grid. The on beat part is what makes this feature a game changer. With a few clicks of the mouse you can find the part of a track you are looking for and not worry about phrasing. Keep in mind when using beat jump make sure the beat grid of the track is correct. Beat jump works around the beat grid, so if the beat grid is off the beat jump will be off as well. Most software that has beat jump allows you to select the length in beats that you would like the move through the track. Be sure that you have the correct length select before you start jumping through the track. Along with length controls there are controls to jump either forward or backward. Make sure that you are aware of which button you are hitting as they are usually placed pretty close together. This can be less confusing when using a controller with tactile buttons. For DJs who place their cue points based on song structure, beat jump speeds up the track preparation. For example, I like to place a cue point at the beginning of an intro, mid-way through the intro, and at the end of the intro. Beat jump allows me to just click through the track on time instead of having to scrub through the track. When introducing new songs into your sets there is a period of getting familiar with the track. Some songs might have 32 beat build up, some may only have 24 beats. Using beat jump to get move through the track on beat makes learning each song much faster. Adding beat jump to my preparation and performance work flow has been nothing but positive. It’s easily overlooked and definitely under-appreciated. Give beat jump a try, add it to one part of your DJ process.